Now you just have to write the story. Categories: Friday Prompts, Writing | Tags: gorilla, writing prompt | Permalink. 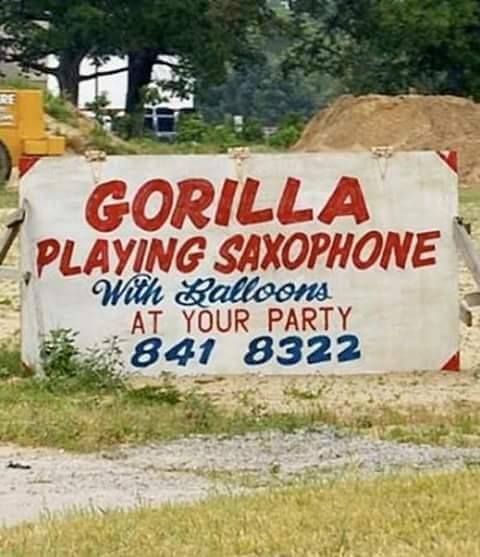 My question is: does the gorilla play the saxophone by using the baloons, or does he just play it with his fingers while surrounded by baloons? I hope at least the gorilla is playing saxophone while floating in the air, suspended by a bunch of balloons. The idea of the primate massaging a balloon attached to a saxophone to play Take Five feels a little cheap.